Mega Bloks Call of Duty Mob of the Dead review! Alcatraz zombies! Here's something a wee bit different! No cute little yellow smiley faces or colorful augmented future soldiers here! This set sends you back in time to scrap with undead prison patrons! "Build the Call of Duty Mob of the Dead Collector Construction Set by Mega Bloks. The eerie silence of Alcatraz island is broken by a zombie infestation in Mob of the Dead. 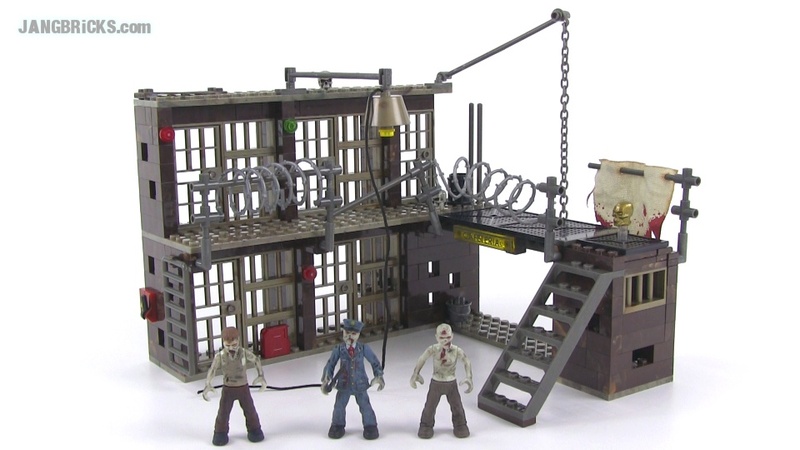 This highly detailed, two-level buildable prison structure features four prison cells, remnants of a cafeteria, a decrepit staircase, and loads of barbed wire, chains and skull accessories. The Mob of the Dead construction set includes three poseable detailed zombie micro action figures, including a brand new zombie guard to haunt your imagination.